Rostov-on-Don is 1076 km southeast of Moscow. It is situated to the southeast of the East European Plain, mostly on the right bank of the Don river, 46 km from its confluence with the Sea of Azov. It is the administrative center of Rostov Oblast and since 13 May 2000 the Southern Federal District of Russia. It was founded in 1749 by order of the Empress of Russia Elizaveta Petrovna. 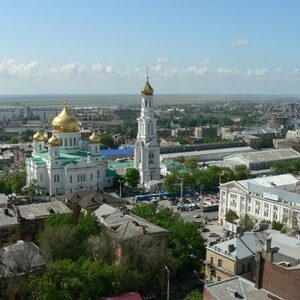 Rostov-on-Don is the southern "capital" of Russia with the population of 1,089,900. It is a large administrative, cultural, educational and industrial center of the country. The city is the important traffic center of the South of Russia. People call it "Gates to the Caucasus" since everything that goes to the south must pass through this point on the map. On 5 May 2008 Rostov-on-Don was given the rank of "City of Military Glory". The climate of Rostov-on-Don is humid continental. The winter is cold, with the average January temperature of -4.4 °C. January of 1940 saw the lowest recorded temperature of -31.9 °C. Summers are long, warm, and sunshine is abundant. July averages 22.9 °C. The city's highest recorded temperature of 40.1 °C was reported on 1 August 2010. The mean annual precipitation is 618mm, the average wind speed is 2.7 m/s, and the average air humidity is 72%. As per January 2007 Rostov-on-Don has 48 higher educational establishments, including 13 universities, 9 academies, 34 secondary schools of vocational training (including 24 colleges, 5 technical schools, 5 specialized schools), 40 elementary schools of vocational training as well as 159 schools of general education.